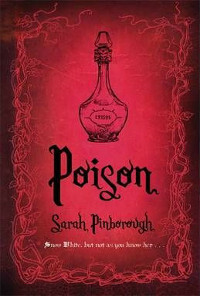 Poison by Sarah Pinborough, Gollancz, 200 pages, £12.99 hardback, 2013. Fairy tales are as old as time, or so it appears. Certainly they’ve been around for untold centuries, educating, informing and entertaining generations of children (and adults, too). In times when literacy was a rarity, the telling of these tales was one way of disseminating cultural mores and promoting social cohesion amongst villagers. However, there’s one thing that perhaps a good number of people out there are unaware of: although the stories gradually evolved and changed in their telling (as all living stories do), collectors and compilers of the likes of the Brothers Grimm and Hans Christian Andersen changed and bent them to their own agendas. The original, traditional fairy tale was an often dark and grim affair, and would surely be deemed unsuitable for today’s children: let’s not forget that back then they reflected life as it was, a time when life expectancy was short and many children never made it beyond their first five years. Much of their content was sanitised and moralised by the later editors, the stories being moulded to conform to Victorian notions of morality, propriety and gender roles. One could aver, then, that what we have today are bowdlerised redactions of the originals, which are missing most of their power and intent. Writers such as the late Angela Carter and the very much alive Angela Slatter have reworked these stories for modern sensibilities, reinstating as far as is possible the subtexts they were initially meant to convey. And now, we can add another name and book to the roster: Sarah Pinborough, who has just released Poison, the first in a trilogy of reinterpretations of classic fairy tales. This slim volume takes the traditional Snow White story, and wrangles it into a version that would give Walt Disney several aneurysms with some grit and unabashed sexuality. The basic elements and characters are recognisably still there, of course: it wouldn’t be Snow White otherwise. It’s just that said elements and characters have been forced into disassembling themselves, only to be put back together into much more adult renditions. Okay, before I go any further, let’s have a short recap of what’s going here. The King has gone off to war (again) and left his second wife, who he married after being widowed, in charge of the kingdom. The new Queen is intensely jealous of the natural beauty of her step-daughter and her consequent popularity: almost as soon as the King’s out the portcullis on his way to the new war, things begin to change in the kingdom, at the heart of it a desire to strike fear and suspicion in its citizens. In tandem with this is a ruse to mould her stepdaughter into a proper princess, so she can marry her off to some suitable eligible bachelor prince and thence get her out from the castle. The Queen’s inner bitterness eats at her and so she indulges in all manner of schemes to oust Snow White from her life, but somehow none of them come to fruition. All the stock characters are present and accounted for: the Wicked Stepmother, the even Wickeder Step-grandmother, the Kindly King, the Seven Dwarves (including one called Bolshy! ), The Huntsman and The Handsome Prince. However, they’re not quite as we’ve come to know them. The Snow White in this iteration is still vulnerable, but it’s allied to an unconscious sassiness and sensuality coupled with an untamed (and untameable) wildness and free spirit. She rides a horse like a man, laughs regularly with the simple joy of life itself, and can drink most other men under the table – traits one would think were totally unbecoming of royalty. The Queen, although icily beautiful in her own right, possesses an unconstrained jealousy of Snow White; the girl’s natural charms and unaffected manner, plus her famed beauty, reminding her of everything that she is not. A nasty piece of work, to be sure, but the motivation behind her ill-will is less to do with pure nastiness than insecurity and a sharp self-awareness of her precarious position. Additionally, she’s goaded by her grandmother who, despite the outward appearance of being a typically mild, crumpled and harmless elderly relative, bears a streak of calculated cruelty seven leagues wide. Furthermore, The Handsome Prince isn’t all he’s cracked up to be either, being something of a stick-in-the-mud beholden to his own princely perceptions. As light relief we have the Dwarves, who are as coarse and rough around the edges as the miners they are. What Pinborough does here is to subvert so many of the nominal tropes of the fairy tale: it’s a deeply psychological novel, with accurately observed character portraits of the main players and why they act the way they do. There are complex interactions between all the characters and those actions are based on perfectly feasible and very human desires and motivations. Snow White just wishes to remain as wild and as free as she’s always been, while The Handsome Prince just wants a beautiful (but acquiescent) princess as his wife. The Queen, on the other hand, wants no other competition to get in the way of her schemes. As in real-life, things aren’t quite as easy as the fairy tales make them seem, and lines and boundaries of behaviour and social contexts aren’t quite as well-drawn as we seem to think they are. Add to that the fact that solid definitions of good versus evil and morality are incredibly nebulous and osmotic at the best of times, one bleeding into the other freely, and viewpoint is entirely dependent on personal perspective: one man’s meat is another man’s poison, and all that that implies. For me, this briskly and breezily told tale wasn’t just about the story itself, but its subtext, whether intended or not. It appears to be saying that, despite what people tell you, we are all, whether rich or poor, destined to be left with disappointment in the end and that we will ultimately lose what we hold most dear. Life isn’t like it is in the fairy tales – it has an edge as sharp as any magical blade, one that will cut right through you. What one wishes for and what one gets are two completely different quantities. On a more positive note, Miss Pinborough does a brilliant job of emphasising the ambiguity in what leads people to do what they do, especially in those who feel they have a natural entitlement to the reins of power. But, above all that is the stripping away of any notion of rigidly artificial codes of moral behaviour, to leave us the real person in its stead. Snow White is, after all, is something of an Earth Goddess, unafraid of who she is and completely unapologetic for all that. Tropes are wonderfully subverted in this tale, but to good ends. It shows how one utterly free and natural being is a threat to both men AND women, as well highlighting the nebulous reality of societal precepts. Nature has given us one thing and, instead of embracing it as it is, we have attempted to corral and control it. Snow White, in effect, is what unbridled nature wants, in fact needs, to be. A highly recommended read and I am very much looking forward to catching up with the sequel volumes. This entry was posted in Book review and tagged 2013, book, gollancz, poison, review, sarah pinborough. Good to see him striking out with his own blog.